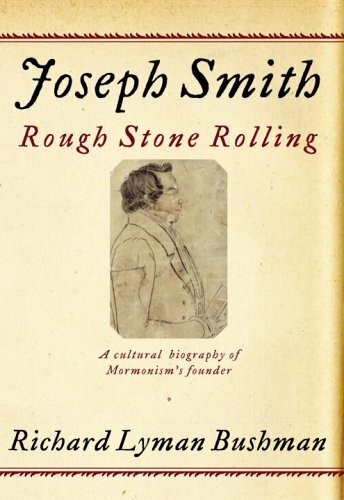 I just finished reading the recent book Rough Stone Rolling by Richard Bushman, a Mormon historian. There is no doubt that this book on Joseph Smith is interesting with many good qualities. With that being said, though, let me say that it’s not the only book on Smith and early Mormonism that a person should read. Since Bushman is LDS, he certainly has presuppositions and an agenda, and while he does provide much truth, there are times he conveniently doesn’t mention important incidents. When he does, he often fails to adequately elaborate, thus softening the implications of his stories. Thus, I think this book ought to be read in conjunction with other biographies on Smith and the history of the LDS Church, of which there are many. In fact, I could list a number of excellent books on this topic, but let me recommend three that I have enjoyed the most. First, The Rise of Mormonism (1816-1844) by H. Michael Marquardt, a book I read in conjunction with Rough Stone. Read side-by-side, I believe I was able to get a much more complete picture of Smith from both the LDS as well as Christian perspective. Second, I recommend One Nation Under Gods by Richard Abanes, which is a fascinating read and well worth the time. Finally, Joseph Smith and the Origins of the Book of Mormon by David Persuitte is an excellent work that provides more background information on the life of Smith during the time he wrote “another testament” of Christ. This sums up the problem with the religion of Mormonism. If there is information that is considered non-faith-promoting, many Saints who trust mightily in their good feelings believe that negative information on LDS leaders ought to be avoided. But why study a person’s life unless you really want to understand the truth about this person? If Joseph Smith is, as Mormons believe, a prophet of God, then by all means everyone ought to consider this church (or one of the dozens of other churches claiming Smith as their founder). If, however, if it can be shown that this man was a fraud, then Mormonism and all other splinter groups ought to be avoided at all costs. My suggestion for anyone is to consider both sides of an issue and come away with a conclusion that satisfies your research, regardless of what facts you might encounter. This entry was posted in Reviews and tagged Richard Bushman, Rough Stone Rolling. Bookmark the permalink. Thanks for your comments. I would also add Fawn Brodie’s classic No Man Knows My History. BTW, I wrote a brief review of Bushman’s book a while back. We seem to have reached the same conclusion about his latest!